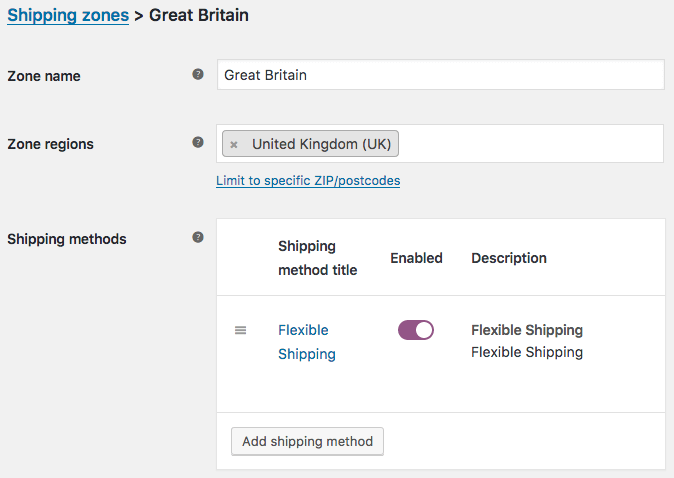 WooCommerce Shipping Zones introduced in version 2.6 are a killer feature making advanced shipping methods a standard. Adding the Zones gives you more flexibility and resolves the problem of creating multiple shipping methods. What’s more, when using flat rate charge for shipping classes, you can create various shipping methods to meet your business and customers needs. Keep in mind that when you want to add more advanced configuration, you still need some extra plugins, such as Flexible Shipping. What are the WooCommerce Shipping Zones? In short, shipping zones are groups of locations to which you want to ship the products. You can easily group continents, countries, states/provinces and even postal codes. What’s more, you can set up separate shipping methods for each zone. Your clients will only see the shipping options available in their area (based on address or geolocation). Where did the Shipping go? After updating to WooCommerce 2.6, you won’t find the standard shipping methods such as Flat rate, Free shipping, or Local delivery. You will see the new shipping zones menu instead where you can find the configuration of all shipping methods. There will be only one – Rest of the World Zone, but you can add as many zones as you need. After doing that you can add multiple shipping methods to each zone. Cool and powerful! You will also see one more change in the shipping menu, which is shipping class configuration moved from the product menu. This is a good step towards integrating your shipment in one place. Apart from that, you won’t see any major changes in the shipping options. There’s no longer the shipping location limit option, for obvious reasons, but you can find a modified table with shipping methods for each zone. The debug mode is also worth mentioning. It helps if you’re missing a shipping method in the checkout that you are sure should be there. 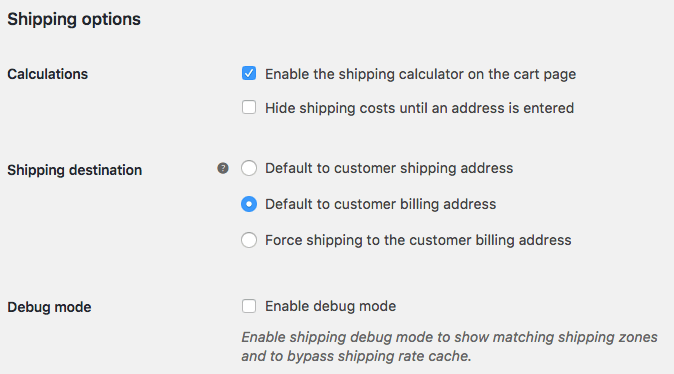 When you enable shipping debug mode it will show all matching shipping zones and bypass shipping rate cache. It is a great help when you experience any problems with shipping configuration. Be sure to enable it before asking for help. What about current shipping methods? WooCommerce authors provided a seamless shipping update. This means you don’t have to worry that the update will make your standard shipping methods configuration stop working. All configured and activated shipping methods will continue working. However you will see the “outdated” suffix after the WooCommerce 2.6 update. Once you set up the new methods, you just need to turn off the old ones and save the changes made to make the old method deleted for good. Unfortunately, you can face some problems with external shipping plugins. If you use such extensions, check their compatibility with WooCommerce 2.6 before making an update. For instance, the Flexible Shipping is one of the plugins that were compatible even before the official release of 2.6 version. How to add a new Shipping Zone? Define a zone – set name, select regions and limit them to the selected postal codes, if needed. If done, click Save changes button. Add a shipping method – Flat rate, Free shipping, Local pickup. Click the name of the shipping method and configure it. Managing multiple zones and shipping methods is a piece of cake. You can sort them by using drag and drop. Edit or delete simply by using the quick links menu. 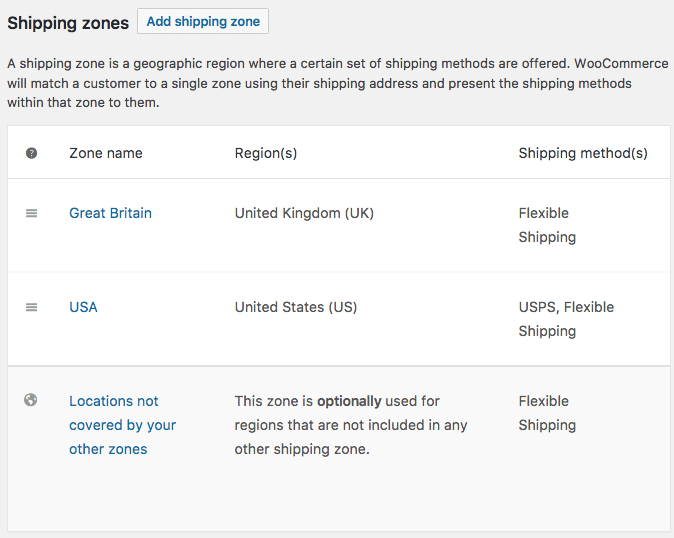 To manage shipping methods in the selected zone, you just need to click on the zone name. You can also see a table where you can organize the order in the checkout. Toggle to quickly switch on or off the chosen method. The advanced configuration mentioned above gives you the ability to add multiple flat rate configurations. This makes it easier for you to add any number of shipping methods and display them based on assigned shipping classes. For instance, until now, there wasn’t any possibility to add to the standard Poczta Polska shipping method a registered letter, postal parcel and Pocztex service as separated methods displayed in the purchasing summary, depending on selected products. Unfortunately, if you counted on having more advanced options, you might be a bit disappointed. You need to know that the method will appear in the purchasing summary when at least one of the products is assigned to the class, despite the fact that other products are in different classes. 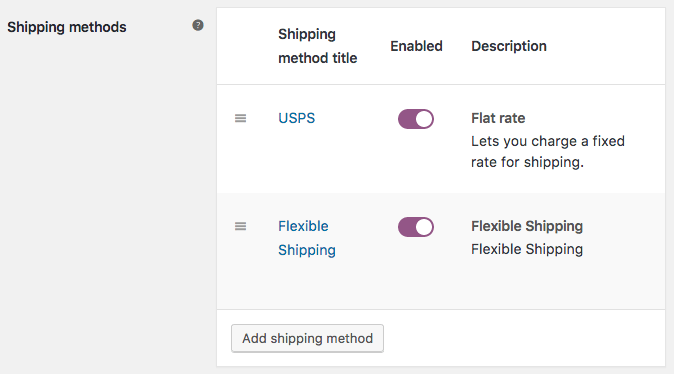 If you only ship in your country and use external shipping plugins, then the upgrade to WooCommerce 2.6 will be subtle and you won’t see any significant changes. But, for simple shipping methods, version 2.6 will be a huge convenience as it will expand the capabilities of standard shipping methods. We also wrote an extensive tutorial to WooCommerce Shipping, make sure to check it out for the complete guide about shipping methods, classes and more.